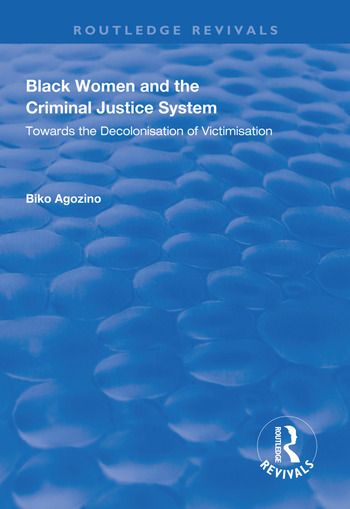 First published in 1997, this book identifies the problems that face black women in the criminal justice system as the result of the articulation of unequal and oppressive class, race and gender relations; the research aims to be aware of all three rather than prioritising, isolating or reducing one or two of these relations. The focus of this research primarily on black women is based on the belief that they are marginalised in both society and criminological research. Black women are poorly represented in education, employment, the professions, commerce, industry and politics while in prison their presence is highly disproportionate to their wider numbers in society. The author examines the problems facing black women and compares these with those facing black men and white women to demonstrate the articulation of social relations. He addresses the structural positions of black women in society, their social relations and the nature of the institutional practices of the criminal justice system. 1. Analytical Framework. 2. Black Women and Justice in History. 3. Black Women and Policing. 4. Black Women and the Courts. 5. Black Women in Prison. 6. Summary, Implications and Limitations.